Richard Amoroso has developed a rich library with hundreds of online classical violin lessons. Students have unlimited access to the interactive violin lessons including sheet music and play along tracks. Learn how to play classical violin from a virtuoso. What ultimately sets these classical violin lessons apart from other offerings is the ability to submit a video for review using the ArtistWorks Video Exchange Learning® platform. Richard Amoroso reviews each submission and records a video response, offering specific guidance to take your violin playing to the next level. All students can access the Video Exchange library and watch each other’s interactions with Richard. This library is constantly expanding and may contain the secret to learning how to play violin. For two decades, violinist Richard Amoroso has served as a member of the Philadelphia Orchestra. He has graced famed concert halls around the world, including soloing at Carnegie Hall, performing at the Suntoryi Hall and the Wiener Musikvere. 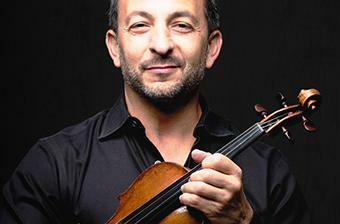 Richard found success early in Violin, performing solo for the Philadelphia Orchestra when he was only 14. After studying and improving his craft, Richard has gone on to perform alongside musical greats, such as Hilary Hahn and Yo Yo Ma, Sting and Billy Joel. He is known worldwide as one of the premier classical violinists of our time. His natural talent shines through his 1765 Nicolò Gagliano violin as a tremendous instructor and musical virtuoso. Basic Pieces - Seitz Concerto No.2 in G Major, 3rd Mvt. String Crossing with Detaché - Vivaldi Concerto in A Minor Op.3 No.6, Last Mvt.